Well, y'all, it's Fall! My absolute very very very FAVORITE season of the year! Fall means cooler temperatures, boots, sweaters, heavy soups, football games, pumpkins on the steps, and company. Yes, company. Around my house, Fall means that we host small groups from church, we have teenagers at our house a lot, and we have out-of-town family and friends who stay at our house on the weekends for Razorback football games and treasured visits. So Fall means company. See?! I like to have a bite of sweet ready for the eatin' when company comes. And this cobbler is my go-to, easy as can be, dessert that is warm, fruity, sweet and tart, and cakey all in one! And if you put a scoop of vanilla ice cream right on top, you will think you've gone to Heaven. Now the reason I don't call this "Blackberry Cobbler" is because...ready for this....you can use just about any fruit at all! Peaches, cherries, blueberries, mixed summer berries, strawberries and more! And another reason Company Cobbler is even dreamier is that you can use frozen fruit. Ta-da! 73 reasons to love this dessert. You can certainly make cobbler in a casserole dish but I always bake mine in a 12" cast iron skillet because, well, it's about as charming as can be. Reason 74 that this cobbler is the best: you don't really have to have company coming to make it. You can make just make it because it divine. Happy Friday! Enjoy your people this weekend, and go make cobbler! Company or not! Place the stick of butter in the cast iron skillet, and place in the preheated oven to melt about 5-6 minutes. Place the fresh fruit or partially thawed fruit in a bowl, stirring in optional lemon zest and about 1/4 cup or so of sugar on the fruit to sweeten. Set aside. The sugar will help the fruit release natural juices while it sits. In another bowl, whisk together the flour, baking powder, cinnamon and pinch of sea salt. Add the one cup of sugar, milk and vanilla; whisk till well combined. Remove the skillet from the oven with an oven mitt or potholders, and pour the melted butter into the batter and whisk to combine. Pour all of the batter back into the hot skillet, then spoon the juicy berries around the center of the batter. Yep, just right on top! 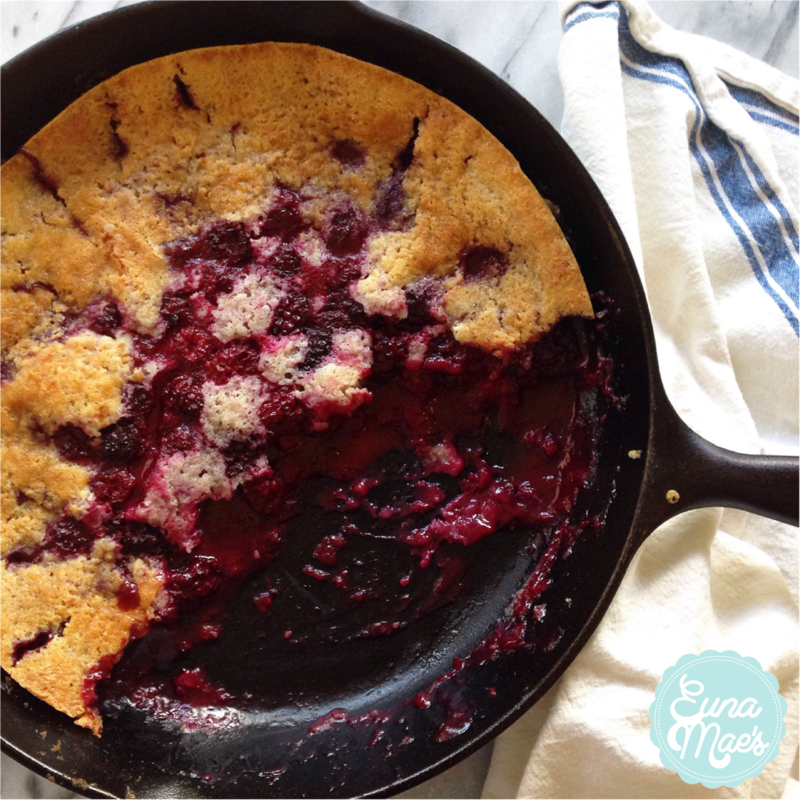 Sprinkle the entire top of the skillet with sugar - batter, berries and all! Bake right around 1 hour until the top is golden brown and the batter looks crisp around the edges and has pulled away from the pan. Serve hot or warm with ice cream. Can be eaten at room temperature too!